With flat horizontal “jaws”, analogue of clamp 2 with larger “jaws”, for large premolars. One of the clamps in torvm clamp’s complete line of Satin Steel® Rubber Dam clamps for anterior, premolar and molar applications. The Satin Steel®matte finish helps reduce the glare caused by operatory lights for less eye fatique and improved clinical outcomes. Choose from winged, wingless or butterfly designs. 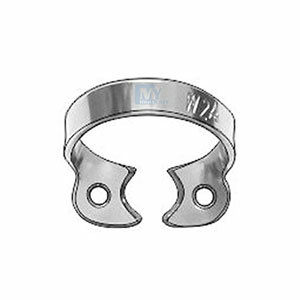 All 48 clamps are made from torvm’s popular Satin Steel®. torvm also has a full range of basic accessories useful for rubber dam clamp applications including classic forceps, punches, frames, templates and organizing accessories. Made from proprietary Satin Steel. Handcrafted to precise specifications and exacting quality standards. Designed with a perfect balance between strength, flexibility and “memory”. Heat treated for maximum strength, secure fit and lasting memory. Select from 48 different clamp designs.